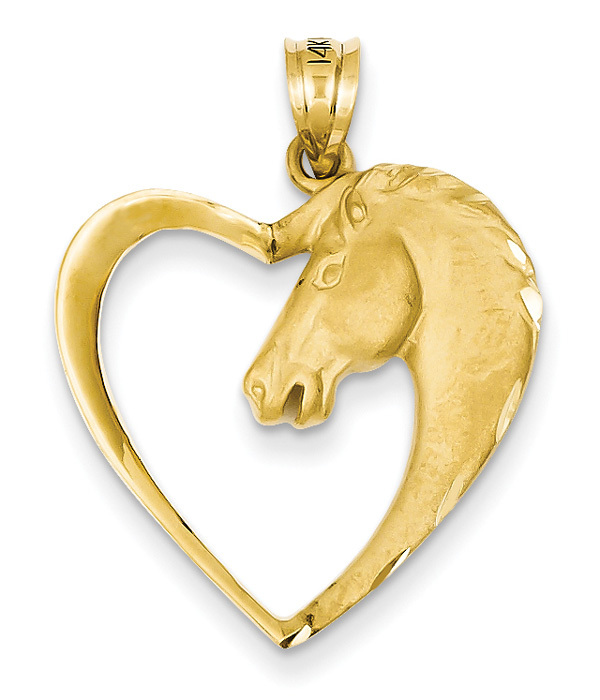 Those who love horses will fall in love with this horse heart pendant in 14K gold from Apples of Gold Jewelry. This stunning pendant, which is made from 14K yellow gold, features a heart with the right side made up of a beautiful horse's head and face. The pendant is open backed and looks completely stunning, and those who are fans of horses will appreciate this beautiful pendant. It measures 1 1/8" tall by 7/8" wide, and weighs approximately 2.66 grams of 14K solid gold. The surface of the pendant has a satin-brushed finish, adding more beauty to this U.S.A. made pendant. We guarantee our Horse Heart Pendant in 14K Gold to be high quality, authentic jewelry, as described above.